On Wednesday, a fierce March wind hurricaned through West Michigan. Traffic lights swayed, trees whipped about, and any remotely weak branches snapped off and littered yards and streets. Of course, power lines went down. My house lost power Wednesday morning, setting off our stupid smoke alarms for some reason. I had to come home in the middle of the day to deactivate them so as to reassure our neighbor and spare the poor dog’s keen ears. A cleansing wind, I thought to myself, as I drove back to work, maneuvering around dead branches and potholes. A Lenten wind. It felt like that, as if the Spirit suddenly got a notion and declared, Time to clean house. It was one of those sunny but briskly cold days, the sort on which women of another era would have dragged all the rugs out of the house in order to beat the dusty winter out of them. While Matthew’s account allows for rich theological exploration of the three temptations and Jesus’ response to them, I almost prefer the urgency and mysterious privacy of Mark’s account. The wilderness hits Jesus suddenly, and who knows what happened to him out there? The English translations tend to soften Mark’s Greek, which is something more like Immediately, the Spirit drove him into the wild place. The wilderness sojourn follows hard on the ecstatic moment of Jesus’ baptism, as if, just as the heavens opened to a God-pleased thunder-voice, a fierce wind came up and swept Jesus away. There was no time for thoughtful consideration about the need for a spiritual retreat, no time to make a list of spiritual practices to work on or gather books for contemplative reading. No time even to gather up a few provisions. I’ve been thinking this week about people I know who have been driven into the wilderness. A friend enduring another round of chemo for colon cancer. Another friend whose mother is dying, slowly. Parents of children with harrowing combinations of depression and substance abuse. These are the sorts of wilderness times that hit us without much warning. They sweep us suddenly out of our settled places, without much provision. They leave us bewildered—etymologically the most fitting word for it. I wonder if that is the true definition of wilderness: places where we find ourselves unprepared and bewildered. No solution seems obvious or forthcoming. Sometimes we can’t even name the problems. We wander like those other wilderness-dwellers, the Israelites, disorganized and ill-equipped, chasing after some strange, divine smoke-and-fire. It’s easy to succumb to temptations. There are wild beasts. There are angels, too. The wilderness can be cold and fierce, but God sends angels. I know this from my own wilderness sojourns. In those times of bewilderment, the bread of angels is especially nourishing and sweet. Still, whatever beasts and angels come calling tend to visit us in the bleak, interior landscapes of our souls, so it’s difficult to describe these experiences to others. We can only offer the barest outlines of our wilderness stories. This is why Mark’s reticence in his temptation account seems right to me. It places Jesus where we sometimes find ourselves: in the wordless dark of our own bewilderment. If Mark’s story is for real experience, Matthew’s temptation story—balanced, complete, instructive—fits with the intentionality of Lent. Liturgically, Lent is preparation for Passion week and for Easter, but experientially, Lent is practice for being driven into the bewilderments of life. We practice deprivation—just a little. We lean into simple delights, fall into goodness. We pray more, try out spiritual practices, strengthen our spiritual muscles. The season is ritualistic and somewhat artificial, but no less meaningful and important for all that. Practiced preparation is essential, but the times that sweep us away do not succumb to the neat contours of the church calendar. 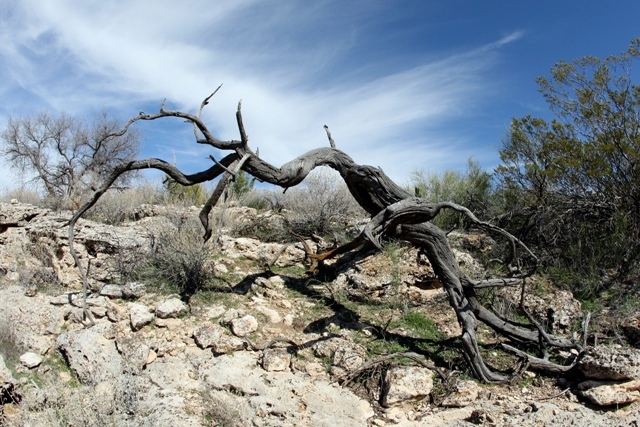 Real wilderness sojourns shake out our dead branches and beat the dust out of us. I suppose my husband, son, and I might have responded to our windstorm power outage with a sort of frontier spirit. Let’s consider this a spiritual practice! We’ll be ascetics for three whole days! Wear sweaters and gloves in the house, build a fire, read by candlelight after eight p.m., cook on a camp stove. Instead—unprepared—we fled the premises after the first night and stayed at our daughter’s house. We wanted internet and central heating. We had stuff to do. We probably missed an opportunity. Even so, that first night, huddled under the covers in my fifty-five-degree house, without so much as the hum of a refrigerator to distract me, I marveled in the utter dark, finally attentive to the sound of the wind.